The Iftar, taken from the Arabic إفطار‎, which literally translates as ‘Breakfast’, refers to the evening meal when Muslims end their fast during Ramadan. In Morocco, as elsewhere, it is traditional for people to try and break their fast at home, with their families. Therefore in the moments leading up to Iftar there is a rush of activity as locals close their shops, finish their work and rush home in time to break fast. The moment after the call to prayer rings out, there is a rare moments of serene silence that falls over Marrakech: the usually bursting streets are empty; although never empty, the Jemaa el-Fna takes on an eerie silence; and a lot of the shops close. However, the silence does not last for long; within half an hour the local Marrakchis flood back on the streets to work, rest and play. 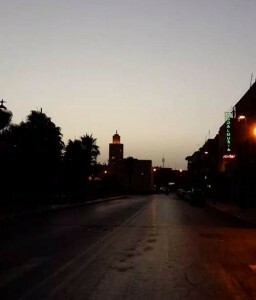 Everything returns to normal; Marrakech is alive again. This entry was posted on Thursday, July 24th, 2014 at 10:26 pm	and is filed under Marrakech, Photo a day. You can follow any responses to this entry through the RSS 2.0 feed. Both comments and pings are currently closed.